Would you mind offering your advice on where to stash supernumerary relatives and friends? Regional hotels, motels, bed & breakfasts, boarding houses; where have you had a good experience? The better writers can describe the positive stuff. But I will be happy with your simple listing of places you think are adequate. Cautionary notes are welcome, too. And if you send a photo I will be hunca-munca. People treasure the Crescent City partly for its characterful saloons and barkeeps. 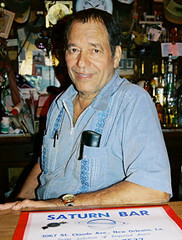 With the passing of the Saturn Bar's proprietor, O'Niel Broyard, our attention goes once more to the Choctaw-Creole city of New Orleans. The Nola.com obit, in part: "According to a report from the Southern Foodways Alliance, O'Neil Broyard, the wonderfully eccentric owner of New Orleans' well-known Saturn Bar, passed away on Thursday, December 22nd." You can enjoy a slice of the Big Easy's talk-and-food-centered life in this Bartenders of New Orleans interview. Thanks to Shannon Glasheen Brock for the note. "The artists party on Fri, Dec 30, is a closing for the first Deck the Halls Xmas workshop," says Artspace co-manager Danielle Reans. "It is also an artists' appreciation party for all the talented people who have shown here since the opening." The get together is from 5 to 9 pm. Artspace will be closed for the New Year's weekend. Deck the halls artists must pick up their work on Tues, Jan 3 or Wed, Jan 4, says Reans. SRAC's offices will re-open Jan 3. 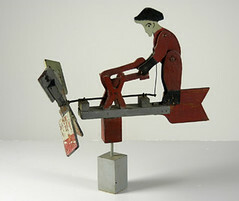 Artists & artisans should grok the guidelines for submissions to Folk Art Is at Shrevearts.org. "Clay and I took Jane and Andy to the airport early the morning after Christmas and then decided to take our own city tour of the levee breaches and the results of flooding. Here are some of the grim and astounding sights we saw. The first shot is of two charming cottages in Lakeview that clearly tell the story of how much floodwater they steeped in. They are also stained with the orange, spray-painted X that is the mark of Cain on almost every single house in New Orleans; it tells of the house-to-house search for bodies. The minor litter in the front yards shows that the debris piles of soaked sheetrock, mattresses, and furniture have been removed already." New Orleans photos, Dec 26, 05, by Kathie & Clay Cranford. "The second photo is of the largest, most devastating breach along the Industrial Canal which obliterated much of the ninth ward. (It was up this levee that Prince Charles and Camilla climbed when they visited last month.) The break must have come with great force and violence because everything is smashed to smithereens for blocks around. Several blocks away, whole houses were moved off their foundations and were washed into the streets where they sit today, blocking the way." New Orleans photos Dec 26, 05, by Slidell resident Kathie Cranford with husband Clay Cranford. destruction. I never thought I'd see such sights in my life. We have been told and have found for ourselves that scores of photos just cannot tell the story. Being there in person and surveying the scene in 360 degrees really brings it home to you. We took Alexandra and Sumanth and Shamin, in Slidell for their Christmas visits, to see the scenes the next day, and they too were in awe of the sights. The worst part of the city is no more than a five-minute ride from the untouched Quarter, where we ended our tour on a high note. 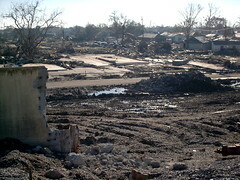 New Orleans photos and commentary by Slidell resident Kathie Cranford - with husband Clay Cranford - on Dec. 26, 05. "Through the breach sailed this enormous barge which now lies on the land side of the canal, having come to rest on the school bus and in someone's front yard. 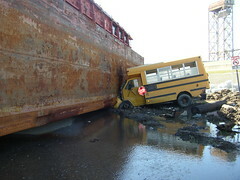 The floodwall can be seen in the background to the right of the bus; it's intact here; the breach is a way down." Dirtfoot, the curlicued circle that will energize your enzymes, plays at Columbia Cafe on the hallowed 31st of December, says p & p percussionist Aaron Butler. The sextet should begin the beguine about 10 pm. From the western side of the mandala, northward: Scott Gerardy, Matt Hazelton, Eric Gardner, Lane Bayliss, Aaron Butler and Jay Bratlie. Enjoy Matt's growl and the band's ruckus at myspace.com/mydirtfoot. Matthew Linn's plan in regards fitting a swingin' sextet and the Dirtfoot gypsy audience into his intimate restaurant? According to Butler, "We're playing from 10pm-1am outside. That's as long as the weather stays the way it is. There will be $1 Abita and champagne specials. And there's no cover." More on where to ramble for diversions on New Year's eve at ShreveportRocks.com. Check in with the entertainers themselves at the Rock talk on the SRForum. Thomas Little's show at Prima Tazza, an exceptionally clean coffee shop at Ashley Ridge ( (318) 550-0174), will offer 10 drawings and acrylic paintings and a single stone carving. Little says, " I used several different styles including abstract, surrealism, naturalism, and expressive." The young artist continues, "I've always been fascinated with the concept of creating a 3-dimensional image on a flat surface. Though the white shapes are flat, they suggest a depth greater and more real than the colors and textures that surround them. We tend to perceive these objects as simple 3-dimensional shapes rather than flat designs. I cut holes in my canvases to emphasize their flatness and unmask a true third dimension." There's a reception to celebrate the unmasking; it's January 6 from 5 to 7pm. 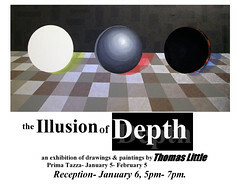 The show will be up thru Feb 5. Gourmands, interested fans of the dance and uncomplicated partiers alike might enjoy Utsav Restaurant on New Year's eve. 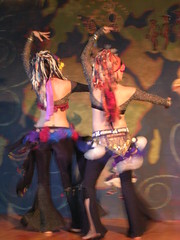 Port Belly Project will be performing 4 short sets between 6:00 and 8:00 at Utsav on New Year's eve, says dancer Kahina. She continues, smiling broadly, "So get a gang, come enjoy some great Indian cuisine and let the party begin! And happy New Year!" Reeta Karmarkar is the proprietor of Utsav. Of the cuisine she says, "The recipes represent a fusion of the cooking of Northern India with other international influences." Hours at Utsav are 11 am to 2:00 pm for lunch and 5:30 to 9:30 (10:30 weekends) pm for supper. Utsav is located at the corner of Fern and Bert Kouns. New Year's eve the restaurant will serve families from 5 to 7 pm and from 8 pm to 2 am take care of the likes of you. 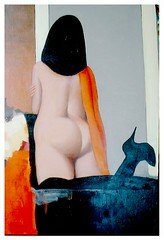 The Masterworks Bermuda Collection is the special exhibit at the RW Norton Art Foundation, 4747 Creswell, Shreveport. The show runs from Nov 29 to Feb 5, according to the Norton web site. Included are 50-60 oils, watercolors and drawings by artists of the 18th to 20th centuries who made their way to Bermuda and islands to the south from their native United States, Canada, Great Britain, France and elsewhere. 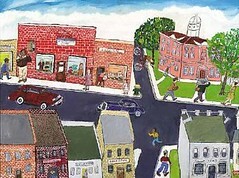 Enjoy reading about the Bermuda Collection at BermudaOnline.org. My blue-roofed sister in Slidell says the Times-Picayune has done a surprisingly good job of writing about cities across the globe that have been devastated by floods and similarly-annihilating events. 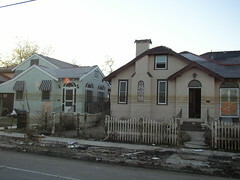 SptBlog has been remiss in not using Nola.com as a source and way to provoke discussions on the fate of the city. On the other hand, none of the Shreveport media have done a great job covering the Katrina aftermath. As far as I know this blog was the only Shreveport spot that trumpeted the NY Times editorial Death of an American City (see SptBlog archives, Dec 11). Is there a web site wherein the state or the nation gets an overview of the city's plight (here's a link to Nova's The Storm that Drowned a City) and the proposals to be considered? Will factory that builds 16-cylinder Bugatti Veyron 16.4, world's fastest vehicle, be located outside the largest city on the Red River waterway? Rumors are inconclusive on whether this vehicle, the Bugatti Veyron, might be manufactured in Shreveport. Here's some background from the NY Times (which does Not mention Spt-Bossier or Alexandria-Pineville as possible factory locations) article "Bugatti Veyron 16.4: To Drive the Impossible Dream." MOLSHEIM, France -- Many people thought that Volkswagen lost touch with its customer base in 2003 when it introduced the Phaeton, a luxury sedan perfectly wonderful in almost every way save for a price tag that veered uncomfortably close to six figures. What, then, will the skeptics make of the Bugatti Veyron 16.4, the fastest, most powerful and - no surprise - most expensive production car in the world? Bugatti is owned by VW, and the Veyron's engine is related, if distantly, to the W-8 power plant available in the last-generation Passat. Not to worry; the Veyron's credentials speak for themselves. A 1,001-horsepower two-seater that blasts to 60 miles an hour in 2.5 seconds - and continues pulling all the way to 253 m.p.h. - the car is a sheer technological wonder. Still, nothing prepares the newcomer for the reality behind the bald performance statistics. The Veyron is blisteringly, and effortlessly, fast. Other vehicles on the road appear to stop as the Veyron whooshes past with the ease of a Formula One car. It is a sobering realization that the grand prix racer is not as fast as a Veyron. More sensational driver's impressions here. How to find your olde friends and the music scene in Shreveport when you're home for the holidays? One source will be the Shreveport Rocks Forum (please see the sidebar on this blog for links). Otherwise, cruise by Lil Joes (also linked here, but maybe they've lost their web person), next to George's Grill, and 516 Soundstage, Texas St. The photo of Dirtfoot above was shot at the perennially popular Noble Savage, also on Texas St. If you're holding out for Dirtfoot, check their myspace.com web site. The site has music and says they're making mayhem at Columbia Cafe Dec. 31. Hmm. 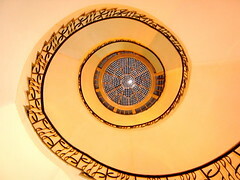 And to whom should I give credit for this excellent photo? If you know the work of powerful painter Bill Gingles, you will be happy to see some of his work in a smaller-than-usual scale. Enjoy his latest output on the walls at Artspace. It's part of the Deck the Halls artisan and artist's market. Artspace is open til 2 pm on Xmas eve, says Danielle Reans. "But please don't knock after 2:01," she says, jokingly. Hm. That Was jokingly, wasn't it? At the Cocktail Parties that I somehow find myself attending, the conversation often drifts into the arena we call Headwhipping Changes in the Digital Marketplace. How do you do this? How do I make my frammis do that? One article that neatly smacks that penguin is a notebook computer (smaller laptops, 12" screens) review in the NY Times by the down-to-earth but fluent tech columnist David Pogue. The evaluation is called "Notebooks come in at under a thousand with speed and style." Pogue's got stats, comparisons, street prices, a point of view; what's not to enjoy? Old Architectural Digests are cloying things; they're full of ridiculous ads - self-parodies - and over-wrought housing that guides the bourgeois aspirations of the non-creative class. But these magazines have enormous value in the workshop: their stock is heavy and perfect for collage work (the covers are primo; I like them for CD case images). As you see in the photo, you can piece together figures of fantastical hue and shape and glue them to a background for creating either grotesque or sleek figures. Each form takes a startling turn as they are assembled; each seems to offer a fresh story. Send SptBlog a photo of your holiday art! That's trudeau@earthlink.net. Found this Milton Fletcher painting online and a couple of mentions of his name. 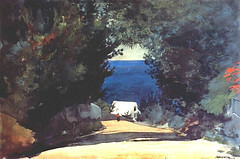 But Fletcher exhibited his charming paintings in this area well before the digital age. Please call me if you've got paintings by Fletcher and / or info on his life in Shreveport. 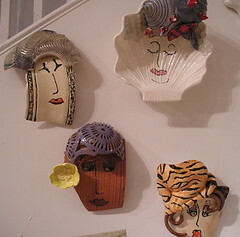 Just pick up the phone and say hello if you have background to share on Fletcher or the area's folk art: 318-861-6809. For the exhibit Folk Art Is ..., which opens in February, I'm documenting the folk art of the area in a brief video. New Orleanian Jon Graubarth hangs with Fats and Aaron when he's designing and producing entertainment. Thus he's an Crescent City insider with a camera and a surrounding feast. Cinemax, plus designs for restaurants and nightclubs that we have built in Atlanta, GA and Ft. Lauderdale, FL as well as projects in North Carolina." 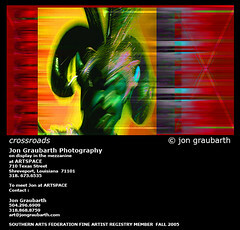 If you like New Orleans, you'll enjoy and appreciate the ramifications of his web site, jongraubarth.com. 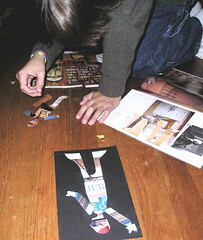 See his digitally exploded photos in a display called Crossroads at Artspace. His technicolor creations are to found in the area adjacent to the upstairs cafe. If you are having trouble picking out a present for a friend or a family member here is an idea that Janet and I like to use and it solves a lot of decision- making problems. Americans are simply storage nuts. Look around you at all the storage buildings with space to rent. So here is the idea. Go get one of those Rubbermaid storage tubs. (The size depends on what comes next.) That takes care of the storage gift. Then get as many useful items that you need to fill the storage tub. Things like extension cords, flashlights, hot hands, gloves, sticky notes and push pins. Any useful item you can think of. Get one tub for each person and fill each tub with as many items as you think that one will use. Who out there hasn't needed a flashlight lately? Don't forget the batteries. Pick up lots of wrapping paper and tape. Wrap each item separately, placing them in the storage tub. Then wrap the storage tub. Apply a name tag for the recipient. VOILA!!! Gift giving has never been so much fun. SptBlog woul'd like to extend thanks to both Sir Kevin the crafts maven and the crazed people in Melbourne - see photo - who reminded us that tubs & bins can be painted, too. In his witty comments from the stage, Michael Butterman, new musical director and conductor for the Shreveport Symphony Orchestra, diasarmed and entertained the Holiday Pops audience. Quite an audience it was; the show was sold out. The SSO is on a streak. "We've had record crowds for each of the concerts this year," exclaimed development director Jennifer Akers. What's going on? "I think it's partly due to executive director Scott Green's sharp insights into marketing," responded Akers. "Partly it's the high quality of the orchestra. After that, I'm not sure." Next concert? Jan. 13, the Annual People's Concert (your ticket has been comped by the Community Foundation of Spt-Bossier). More at Shreveportsymphony.com. * A set of anytime tickets that will take you into the 7 concerts of the new year. * Or a Luxury Raffle Ticket ($100 each; only 2000 will be sold). The raffle is the SSO's principal fund raiser. Crowds may be high, but the SSO's funds are momentarily low. Have you made a contribution to the Annual Fund? Supper and singing and easy parking at Java Junction, corner of Alexander and King's Hwy, says chef and owner Lee Bamberg. The Nadine's boast sister harmonies and guitarist Danny Wilder as their accompanist. 9 to 11 pm. All ages. At the last minute a change in schedule from Java Junction placed the Nadines at 9 pm. Apologies. More than 60 interviews with the founder of Interview magazine are the fabric of the Chris Rodley film Andy Warhol: The Complete Picture. See it at Artspace Th, Dec 15, at 7 pm. Call 673-6535. 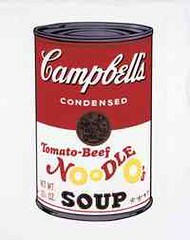 Warhol comes to us via Rene Broussard, a New Orleanian who brought his Zeitgeist Multi-D Arts Center work to Shreveport after Katrina. a) Find a couple of amateur photogs in your organization. Get a steady stream of photos of your people, your activities. Email them to the media. b) Better yet, have someone update your website each week - even each month - with brief stories and photos. That way the media can pluck what they need when they want it. c) If the html of your web site prevents non-techies from updating your site, there is a solution. Link to a blog. SptBlog is assembled using flickr.com and blogger.com. For free. And quickly. It takes maybe 10 minutes to get started. d) Headshots are good. Action shots are better. Think of the images you want as Eye Candy. e) Get what we might call a New Media person to shoot brief videos (it can be done with a basic digital camera, remember) or to record sound bites. Again, you can put them on your web site. Also, send out the address to the media. There's no reason this area should lag in digital consciousness. Unless you're content to kiss off our future . 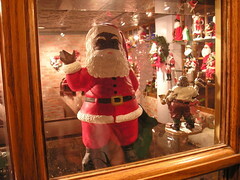 . .
By the way, have you bopped by 610 Texas to see the Southern University Museum at Shreveport display of Afro-Santa's? 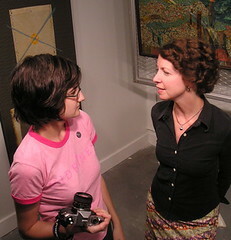 Maybe combine the visit with a stop at Artspace? They're one block from each other. Hours are Tuesday through Friday, 10 a.m until 5 p.m. and Saturday 10 a.m until 4 p.m.
Groups are welcome, but please call 318-678-4631 for reservations. 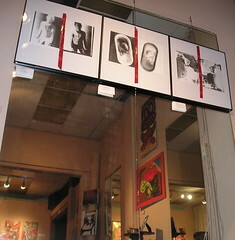 Under Noma Fowler-Sandlin's recent management of Coolspace, undraped artist's models were presented once a month. Here's hoping, for the sake of anatomists and classicists, that the live model sessions are returned to the public agenda. Meanwhile, after a successful opening which featured nudes at Bistineau Gallery, 327 Market St, painter-sculptor Dennis O Bryant sent us this graphic ad. He comments, "It won't surprise you that in the small town of Marshall, TX, where I live and work, that models are in short supply." 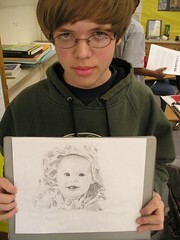 See O Bryant's work at denoart.com and email, as you see above, deno@denoart.com. A stage full of singers and expert instrumentalists will wow audiences at the Civic Theater Sat, Dec 17, as the Shreveport Symphony Orchestra presents its holiday pops show. Michael Butterman, the dashing young conductor, will leap upon his podium and seem to twirl in the air like a snowflake. Margaret Williams Jones, soloist, will hug his neck between each tune. The Red River Children's Chorus will fling its Santa hats into the audience. 'Twill be madcap Christmas madness. More info: Shreveportsymphony.com and 227-8863. Valet parking is limited. The shuttle is merry! Menus & Music, a pre-concert dinner, will be held at the Cambridge Club. A portion of the proceeds benefit the SSO. "We are about to lose New Orleans. Whether it is a conscious plan to let the city rot until no one is willing to move back or honest paralysis over difficult questions, the moment is upon us when a major American city will die, leaving nothing but a few shells for tourists to visit like a museum. We said this wouldn't happen. President Bush said it wouldn't happen. He stood in Jackson Square and said, "There is no way to imagine America without New Orleans." 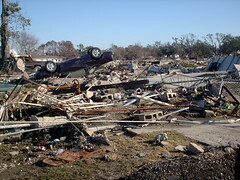 But it has been over three months since Hurricane Katrina struck and the city is in complete shambles. There are many unanswered questions that will take years to work out, but one is make-or-break and needs to be dealt with immediately. It all boils down to the levee system. People will clear garbage, live in tents, work their fingers to the bone to reclaim homes and lives, but not if they don't believe they will be protected by more than patches to the same old system that failed during the deadly storm. Homeowners, businesses and insurance companies all need a commitment before they will stake their futures on the city. At this moment the reconstruction is a rudderless ship." Please see more of this perspective on tragedy, our tragedy, at NY Times/Opinion. Hollywood's Oscar in animation is the Annie Award, says Annie Awards.com. 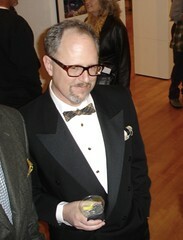 In the 33rd annual Annie Awards nominations for Character Design in an Animated Feature Production is William Joyce, for his design of Robots for 20th Century Fox Animation/Blue Sky Studios. Additionally, William Joyce and friend Steve Martino are nominated for an Annie in Production Design in an Animated Feature Production for their architecture on Robots. Joyce's competition in the Character Design award are the creative personalities who developed the movies Corpse Bride, Madagascar, Chicken Little and Wallace and Grommit: Curse of the Were-Rabbit. the movies Chicken Little and Lilo & Stitch 2 as well as Madagascar and Wallace & Grommit. Joyce, a Shreveporter, has won 2 Annies for his TV series Rolie Polie Olie. Additionally, he has 3 Emmies. The 33rd Annie awards ceremony will take place Feb 4 at the historic Alex Theater, Glendale, CA. Ticket info at (818) 243-2539. "A Potemkin Village that turns the West Edge into a feast for the eyes" is one of the goals of the Artspace exhibit that opens Jan 20, says Mary Frances Querbes. "Imagine Texas Street storefronts - both glass and boarded-up - bursting with colorful murals illustrating the folk life of the Deep South," says June Phillips of Southern University. "And red & yellow & chartreuse whirligigs flying from street poles the length of Texas Streeet," says SRAC's Pam Atchison." Regional artists are encouraged to write up - or sketch - their ideas for a) storefront window installations, b) murals for boarded buildings, and c) whirligigs and get them to SRAC pronto. "Entries will be juried weekly," says Atchison," and the Early Birds get the Worm." Artists who'd like more ideas about a) what the h*ll are they talking about? and b) how to submit a proposal and get remuneration, are encouraged to attend an orientation party at Artspace Th, Dec 15, at 6:30 pm. Another rampart has been overrun by the emerging West Edge art soldiers. 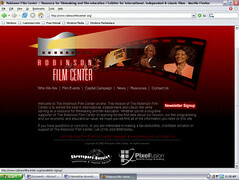 Their new web site is up at WestEdgeArtists.com. Debbie Buchanan Engle, aka Che Guevara, credits Michael G Moore, aka Raul Castro, with construction of the colorful site. While it is far from full flower, the site implies that 1) this is an ambitious gang and if they are successful Shreveport will benefit from a greater connection between artists and businesses. And that 2) the brick beauty of downtown Shreveport has another group of champions. See the site's link to the West Edge District. More of the WEACo corps: LaDonna Hughes, VP; Pam Rowell, sec; Theresa Ratcliff, treasurer. The co-op's home is a beauty: the Uneeda Biscuit Building at 711 Milam St. More info: ask a West Edge Co-op artist about their extraordinary goals. "For the digital artist, there is no more important tool than a Wacom tablet which has a cordless, batteryless, pressure-sensitive stylus that gives controls which far exceed those with conventional media. The basic controls allow you to set how the brush's width, tone and hue respond to the the pressure you apply to the stylus. You also have the opportunity to select from a wide variety of brush stroke shapes and textures. Other controls can be assigned to the tilt of the pen. 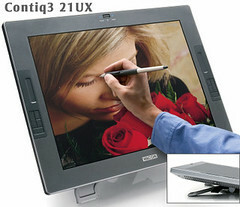 Wacom tablets work interactively with the major graphics programs, such as Photoshop. Wacom has just made exciting changes and additions throughout its product line. A big reason for professionals to upgrade their tablets is the ExpressKeys on the left and right sides of the Intuos3 tablets. As an artist working freehand, it is very, very convenient to have a finger button for Undo, meaning I no longer need to reach for the keyboard or move the stylus up to a function strip along the top (which is gone on the Intuos3). The ExpressKeys also contain a "touchpad" control strip for scrolling, which also means you don't have to move your stylus from your work." Thanks for your canny input, Noma. Shreveport-based filmmaker Phillip Jordan Brooks and host Jeffrey Kallenberg will present an evening of locally-produced short films on Friday, Dec. 9th at Shreveport’s Municipal Auditorium (705 Elvis Presley Avenue), says Chris Jay. Brooks will premiere his newest film, “Deliberate” as well as a selection of earlier works. The program, which runs less than one hour, will be presented at 8:30 PM, 9:30 PM and 10:30 PM. Admission is $5, including a buffet provided by Kon Tiki and free parking lot security. A cash bar and a performance by the Shreveport Metropolitan Jazz Ensemble will also be included in the evening. The film has not been rated but does include combat-related violence. Filmmaker and Bossier City native Blayne Weaver will host an advance screening of his new feature-length romantic comedy, Outside Sales, Th, Dec 22 at the LSUS University Center. The screening, which is free and open to the public, will begin at 7:00 PM. Following the film, producer Kendrick Hudson, writer/director Blayne Weaver and executive producer/actor Brandon Barrera, all Ark-La-Tex natives currently living and working in Los Angeles, will lead a Q & A session. The film has not yet been rated, but contains brief instances of adult language and is offered as a PG-13. Weaver, whose writing credits include 2001’s “Manic” (starring Academy Award-nominee Don Cheadle), wrote, directed, and performed in “Outside Sales”. The film also features Lucas Fleischer (“States of Grace”,”Party Foul”), Tricia O’Kelley (“Gilmore Girls”, “Everybody Loves Raymond”, “Malcolm in the Middle”), and Brandon Barrera (“My Dark Days”). The event is a co-presentation of Secret Identity Productions and the LSUS Student Activities Board, says Robinson Film Center's Chris Jay. 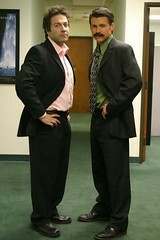 More information on the film can be found at www.outsidesalesmovie.com. David Gardner teaches guitar alongside Danny Wilder at the Guitar Studio. Between his tutoring, Gardner can enjoy a guitar cornucopia, since the Guitar Studio is inside Don Teach's Shreveport Music building. Gardner loves Martin guitars. 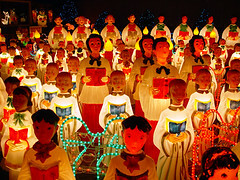 For the SptBlog Xmas recommendation (since when have we been so blatantly commercial?) he chose a Martin D-28 Herringbone. As he plucked the D-28, a full-bodied sound emanated from the spruce body and filled the area. 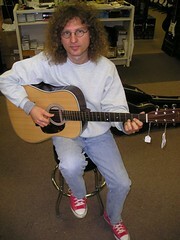 In his studio Gardner plays a Steve Howe model (the British group Yes) Martin acoustic. While the Martin D-28 is about $2000, there are numerous less-costly, rich-sounding and easy-playing guitars in the store, located at 1815 East 70th. Lessons from someone as caring as Gardner and Wilder are also highly recommended. In search of creative tools for Xmas, I found myself nipping into Don Teach's Shreveport Music, 1815 East 70th St. There I heard sweet, jazzy sounds being played on a rock 'n roll classic, the American Stratocaster. The player was auto salesman/ musician Paul Morgan. He works for his brother at Mike Morgan Pontiac, he said. But I would say he eats and breathes music. "I play a Telecaster, the Model T of guitars," he explained. "I needed a Strat." Like a thoughtful musician, he didn't order one from a catalog. He played dozens of Strats at Shreveport Music until he found one with a light body, flat, thin neck and mellow resonanace. Asked to recommend an amplifier, he explained, "Even though I adore tube amps I can tell you that this Roland Cube 30 is an amazing product. Light and rich of sound. And all the fx you need are built in." 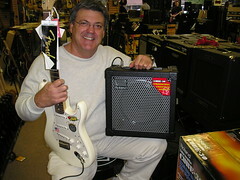 Indeed, across several major guitar forums the Roland Cube 30 and 60 are being given high marks by consumers. 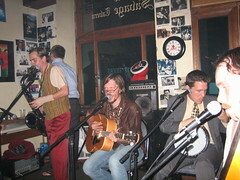 Morgan plays with a group called The New Oreos, "Louisiana's premiere variety band." For booking (based on his playing, I'd book them) call 318-686-3964. New Strats begin at about $300. The one Morgan is getting is $850. The amp is about $250. 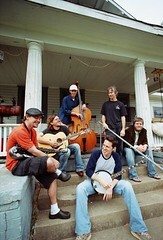 Shreveport Music: 798-6000, as well as Shreveportmusic.com. * Digital camera - let's face it, they're affordable and enormously useful. My 9 year-old uses one to shoot brief movies. The segments can be stitched together using easy-to-use software on PC or Mac. * Laptop! My iBook 12" has changed my life. An example: I can do homework around the family - so can my son - instead of tucked away in the middle room at the desktop computer. * Broadband internet connection. It's a new century and life costs a bit more. Your kid and family are communicators; it's what Americans do. * Router for a wireless connection in the house. Use the fast connection no matter the room you're in. * Classes in digital skills such as Photoshop or Flash. See LSUS, Centenary, BPCC, SRAC, etc. * At the very least, a flash drive (jump drive) in their stocking. What capacity? A 128 is good, a 256 better. * iPod Nano or other flash drive mp3 player: they can be used to transport projects and photos as well as music. Do you have similar suggestions? "Shreveport-based filmmaker Phillip Jordan Brooks and host Jeffrey Kallenberg will present an evening of locally-produced short films on Friday, Dec. 9th at Shreveport’s Municipal Auditorium (705 Elvis Presley Avenue). Brooks will premiere his newest film, “Deliberate” as well as a selection of earlier works. The complete program, which runs less than one hour, will be presented at 8:30 PM, 9:30 PM and 10:30 PM. Admission is $5, including a buffet provided by Kon Tiki and free parking lot security." "A performance by the Shreveport Metropolitan Jazz Ensemble will be included in the evening. There will be a cash bar, too. The film is unrated but does include some combat-related violence." Tatiana Mitchko, Russian pianist studying at Park Univeristy, Missouri, shared the Gold Medal in the Wideman Piano Competition, Shreveport, with Korean Ji-Yeon Shin, who studies at Oberlin Conservatory of Music, Ohio. Mitchko, who was listed in the Shreveport competition as Tatiana Mitchko Tessman, is one of 30 contestants in the World Piano Competition. 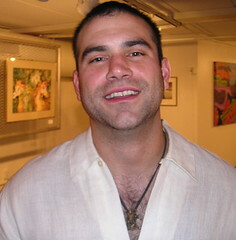 The Bronze Medal was awarded to Michael David Mizrahi. Christine Bethanne Johnson, Megan Glover and Chia-Lin Yang won special recognition awards. Marko Pavlovic won the honorable mention prize. Peter Haas has initiated a public congerie for learning and pursuing the 3000 year-old Asian game called Go. Haas says, "The rules are as easy to learn as checkers but its strategy is as subtle as chess. We meet every Tuesday at Barnes & Noble at 7:00 PM. If you want to know more about the game go to www.usgo.org." The Go board begins bare, like an empty canvas. The game begins to take form after 30 to 50 moves, when the board resembles an artist's pencil study prior to beginning a painting. When a game is finished, after 200 to 250 moves, the lines and groups of black and white form a record of two players' plans and ideas. One of the old names for Go translates as "hand conversation," and in fact a game is really a series of discussions and arguments about the choice of moves. Six finalists have been chosen from the 46 international contestants who have come to Shreveport for the Wideman Piano Competition, says the Times. Fifteen minute performances will begin at 1 pm Sun, Dec 4, at Centenary College, Hurley Music Bldg, Anderson Auditorium, Shreveport. The performances are free and open to the public. See two exhibits at Arodasi Studio / Bistineau Gallery, 327 Market: paintings by Andre Weatherly, Dennis O Bryant and Tony Reans at Bistineau. And work by Andy Sheehee, AJ Carriere, Bruca Allen and Alan Dyson at Arodasi. Two art shows recently opened at 327 Market St, home to Arodasi Studio and Bistineau Gallery. 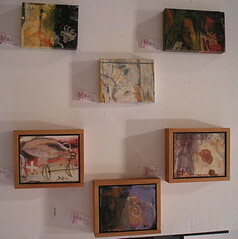 In this photo: photos by David Nelson, paitings by Dorothinia, Michael G Moore and other artists. Dennis O Bryant's acrylic called Con Botas y Chiffon Rojo is one of the pieces to be enjoyed in a show called Three Visions of the Feminine at Bistineau Gallery, 327 Market St, says Rebecca Hudsmith, owner. Across the hall at Arodasi Studios Bruce Allen and Dorothinia present a show called The Art of the Masculine. In the backmost room a giant male organ has been under construction this week, said MDH. No advance photos were allowed by artist Bruce Allen, said my informant. Nor did the smiling, laconic Mr. Allen return my email. SptBlog has heretofore avoided publishing photos of the p*nis, in keeping with the theme of media self-censorship prevalent today. Cleavage good, buttocks (see above) good, p*nis bad. But what about a Tasteful p*nis? An Artful p*nis? Ah so; we have now an entirely different equation. Stay tuned for the agony that accompanies publishing the image of anything but the mammarical. 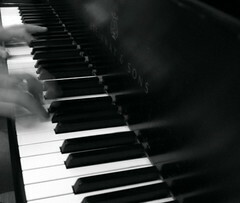 Anderson Auditorium, Hurley Music Bldg, Centenary College, is the site for extraordinary pianistics this weekend. Some 46 international piano ponders will be reporting to a marathon performance / judging scene in the college concert hall. Sun, Dec 4, will see the finals competition, acccording to Centenary. Stand by for more details or drop by Hurley Music Bldg for a blast of musical virtuosity. Also, please mark your calendar for the Shreveport Symphony's Dec 17 concert. It features the Red River Children's Choir, the Shreveport Chamber Singers and Shreveport Opera Chorus. 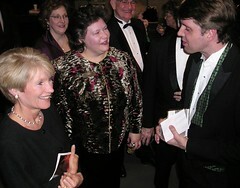 More info on both events at shreveportsymphony.com. Exalted sounds: the candlelight chamber concert in the First United Methodist offered by the Shreveport Symphony Orchestra. The concert is at 7:30 pm, Th, Dec 1.